Traditional coffin smoothers are smaller and more nimble than their cast-iron counterparts. My standard double-iron smoother has a 1 3/4 " iron and is 7 1/2" long. Smoothers can also be made with 2" irons. The irons are normally bedded at 47.5°, the traditional bed angle used in early English double-iron planes. However, I'm happy to accomodate requests for custom bed angles from 42.5°-50°. 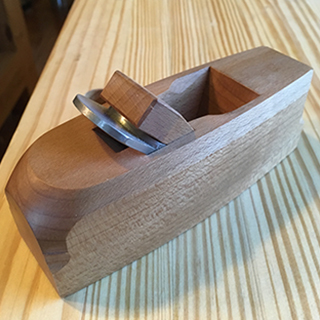 The mini-smoother is the cure for the common block plane. 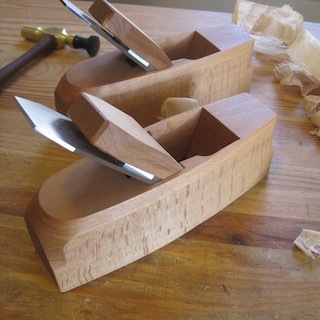 Lighter and more comfortable than a block plane, it can be used either one-handed or with both hands. It has a 1-1/4" double iron and is 5-1/4" long.